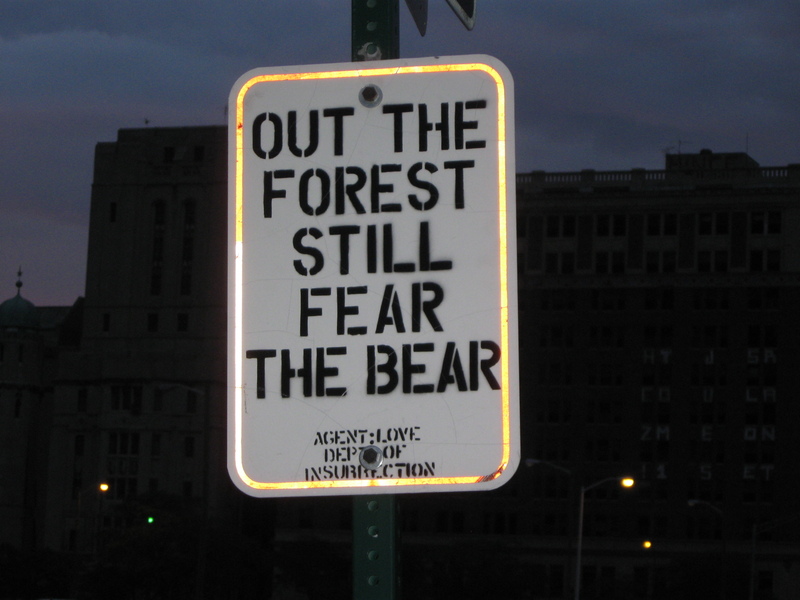 As I have pointed out in past entries on the amusing signs I’ve spotted on my bicycle rides, Detroit is an interesting place full of strange signs. 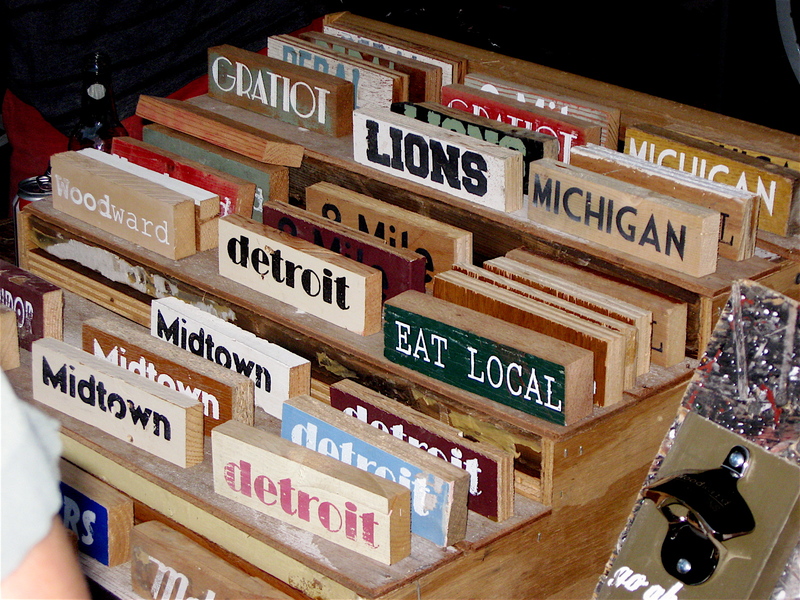 Many are hand drawn on discarded chunks of plywood or other pieces of scrap wood. 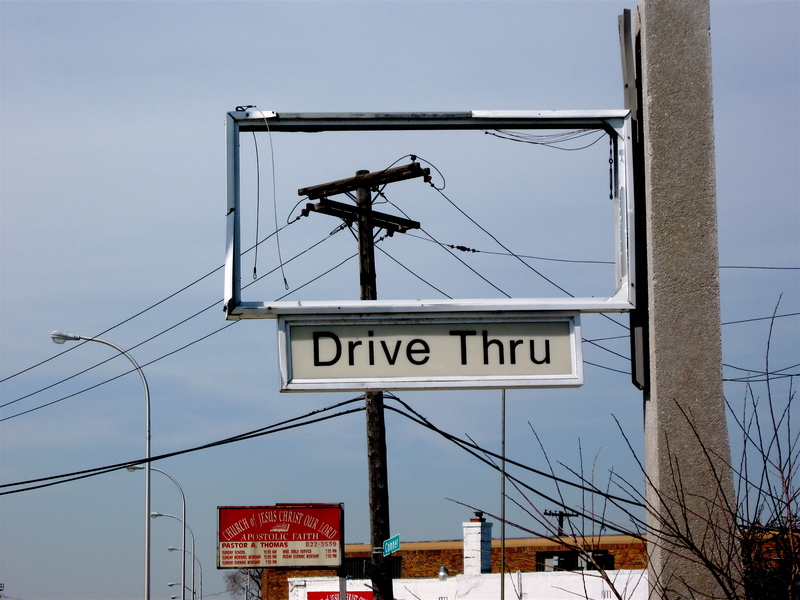 A few are full of misspellings, and they are sometimes hung or placed in the most bizarre locations. Some are quite humorous in their messages, while others are almost impossible to read because the letters have run or dripped into each other because too much paint was used to create them. In this entry, the seventh in an occasional series on Detroit’s quirky signs, I’ve posted a few of the most recent ones I’ve spotted on my rides. Despite the content and hard-to-read messaging found on a few, I do admire the drive and persistence of the many grass-root business entrepreneurs found along the city’s major commercial strips and within the neighborhoods. They are doing what they need in order to advertise their goods and services. 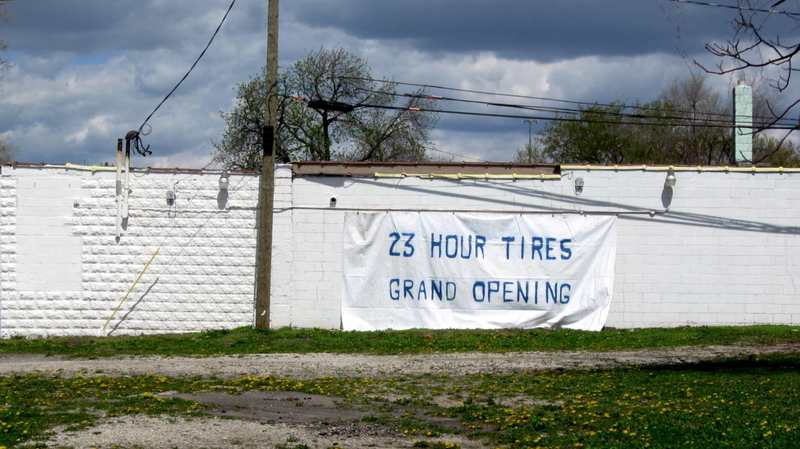 This entry is the seventh of an occasional blog entry on the amusing signs of Detroit. To view the other’s in this series, click on the headlines below. Remember, you can click on any image to view them larger. 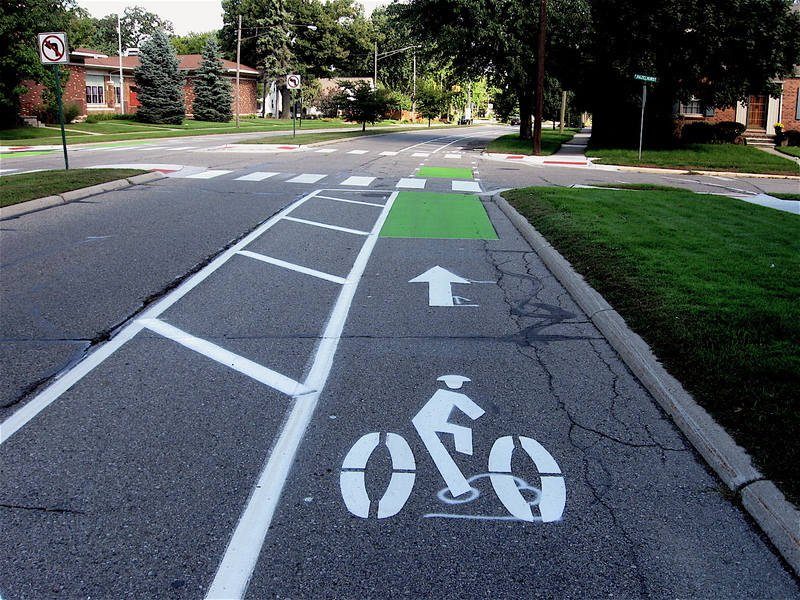 Over the past few years there has been a tremendous amount of bike lanes painted on the streets of Detroit. 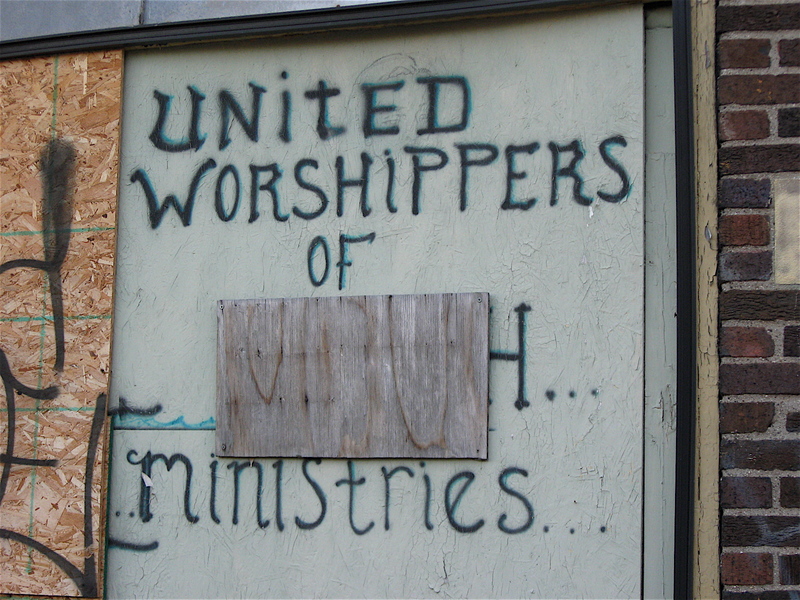 They can be found throughout Southwest Detroit, Midtown, the east side and other sections of the city. It wasn’t long ago that it was rare to see any at all. Now they seem to be everywhere, including some of the inner suburbs, as I noticed over the weekend when I rode out to Ferndale. 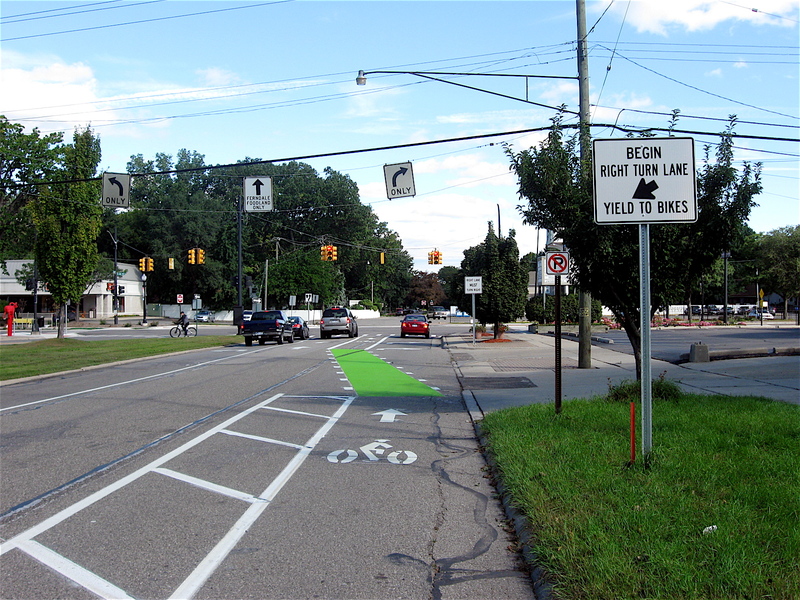 As I rode along Livernois Avenue from Detroit and approached the intersection of 8-Mile Road, I could see green bike lanes up ahead, something I haven’t seen before. 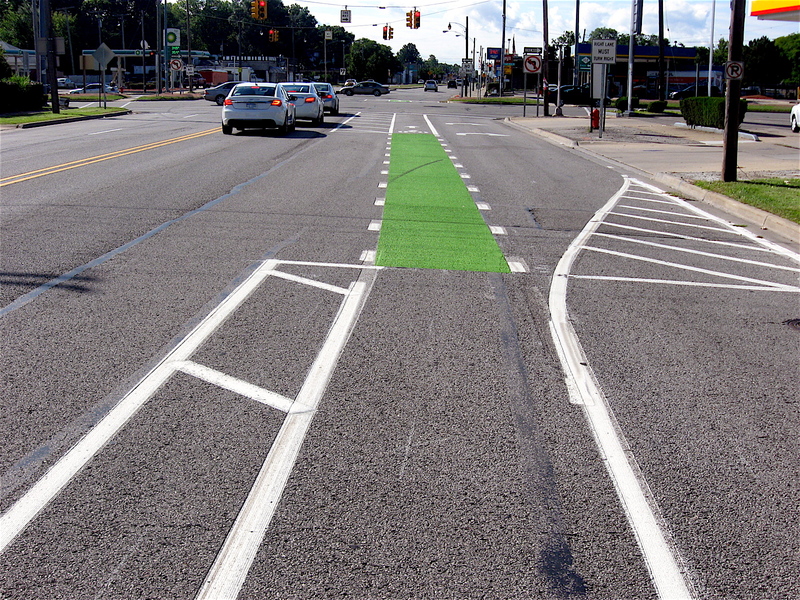 From what I understand, the painted sections of the bike lanes lining Livernois between 8 and 9 Mile roads indicate conflict points. The conflict points are sections of the street where cars and bike riders have a likely chance of meeting, such as a cross street. 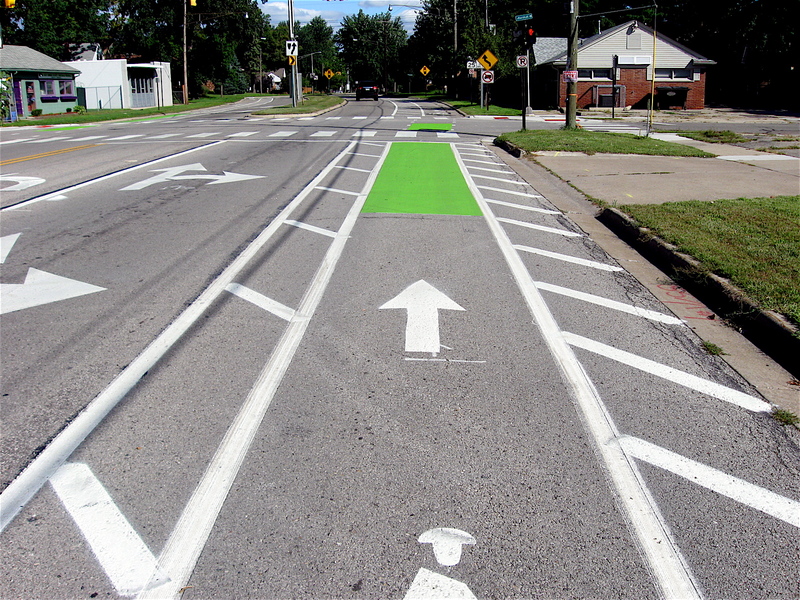 The bright green painted sections of the lengthy bike lanes are designed to alert and bring awareness to both vehicle drivers and bike riders. The green sections are in addition to fresh looking buffered bike lanes along the avenue. The buffer lanes are stripped lines that look to be at least 30” wide that are located between the car lanes (or curbs) and the actual bike lanes. 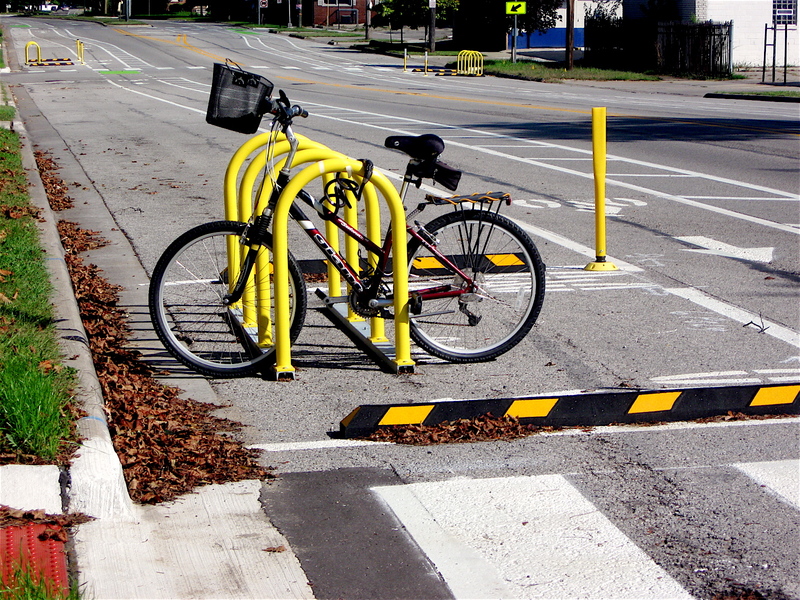 They act as a buffer zone between the bike and traffic lanes adding safety to the riders. 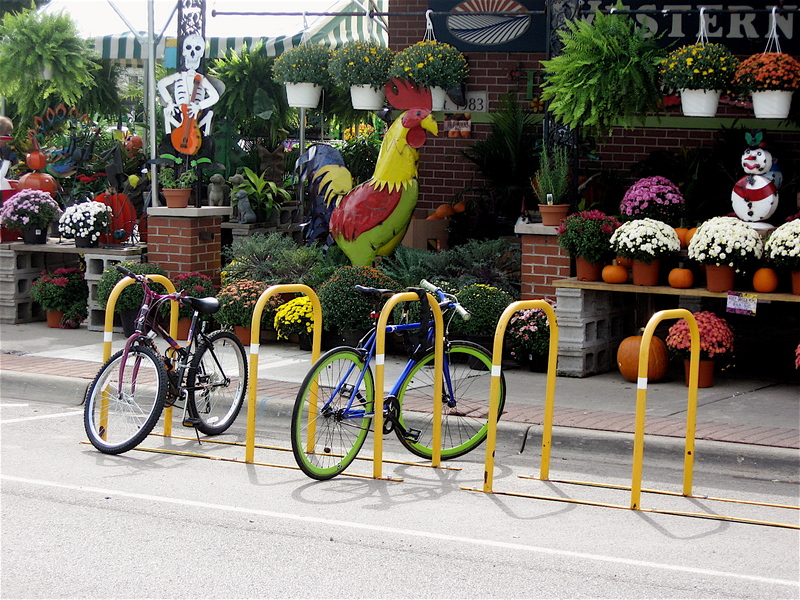 Another nice feature of the well-marked lanes along Livernois in Ferndale is the presence of bike racks. 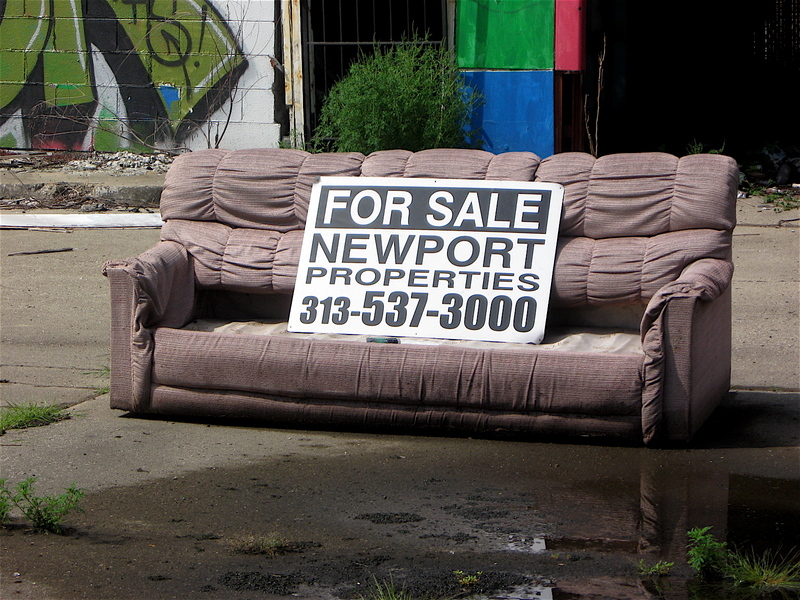 They are incorporated on the curb side of Livernois on both sides. That seems to encourage commuting to work, school, etc. via bicycle. It also implies a bike friendly environment. It was nice to see and ride along the well thought out bike route that incorporates signage, well-defined painted lanes and bicycle racks. Overall, the lanes also create a strong sense of safety for bike riders like me. Good job, Ferndale. 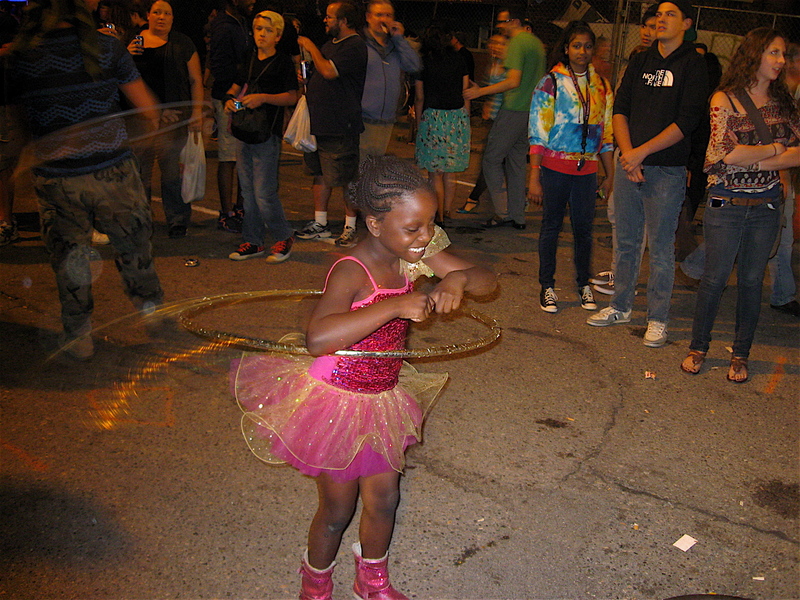 Detroit’s premier street party was this past Saturday. 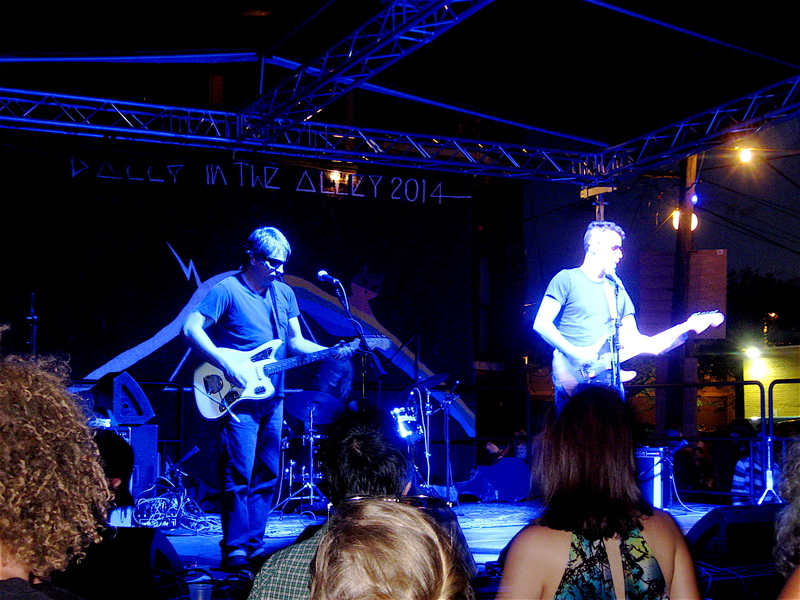 It’s called Dally in the Alley, and it’s been held continuously for 37 years. 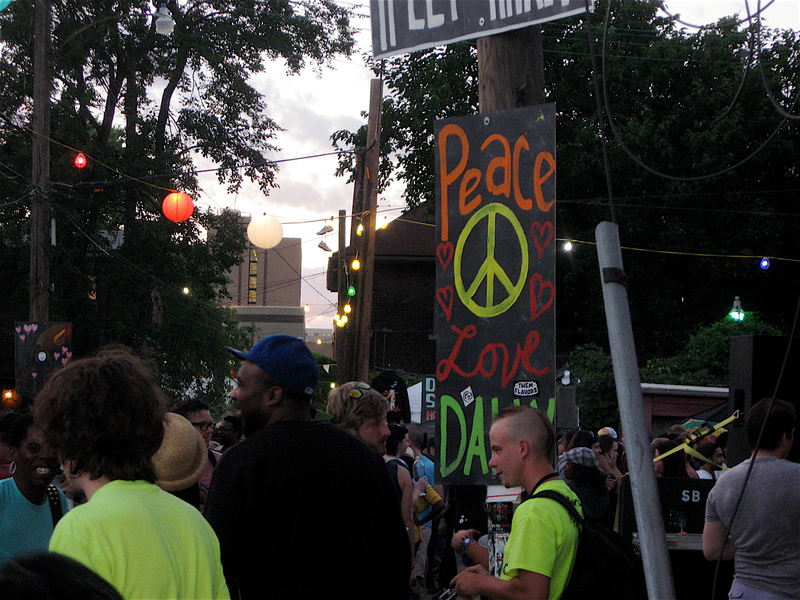 The one-day event takes place in a series of alleys and streets that have been cornered off in the city’s Cass Corridor area near Wayne State University. 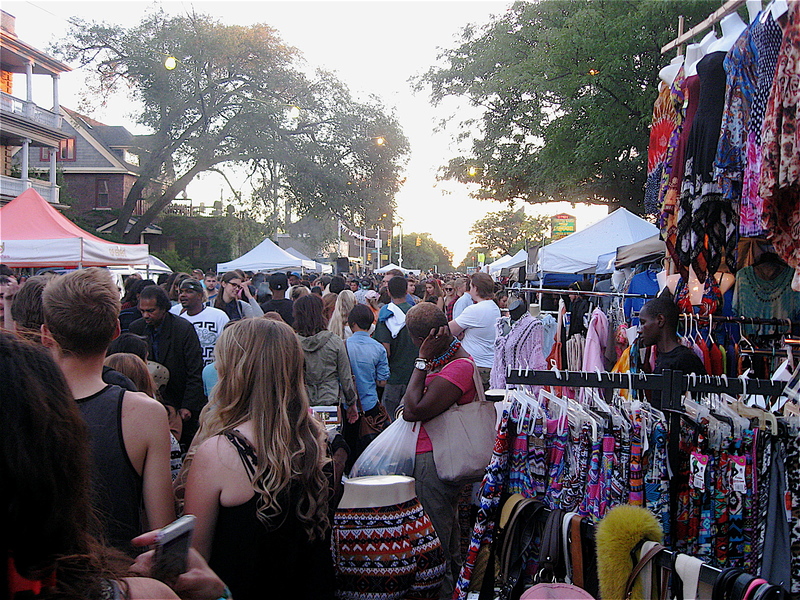 The annual free event features four stages of continuous music, as well as a bunch of vendors selling art, t-shirts, clothing, vinyl records, and plenty of food and drinks. 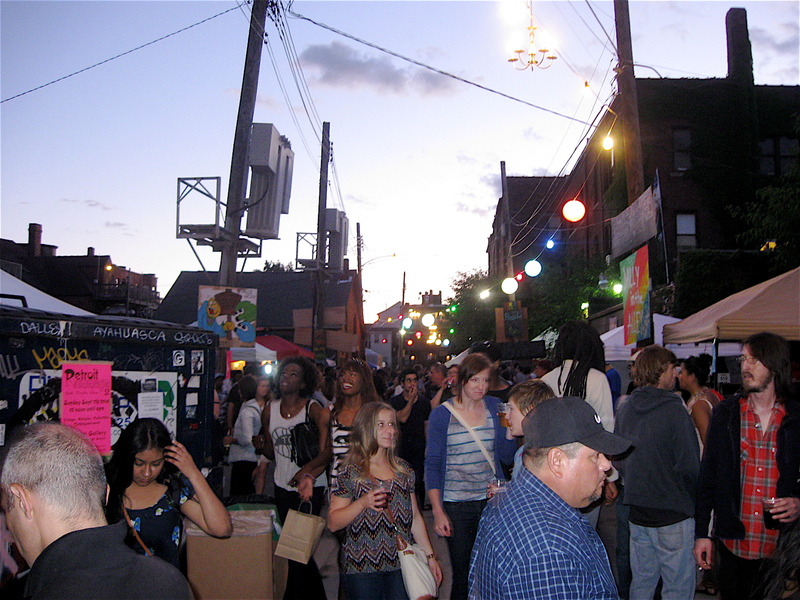 The alleys and surrounding streets (bounded by Hancock, Forest, Second and Third Avenues) were jammed packed with thousands of people. 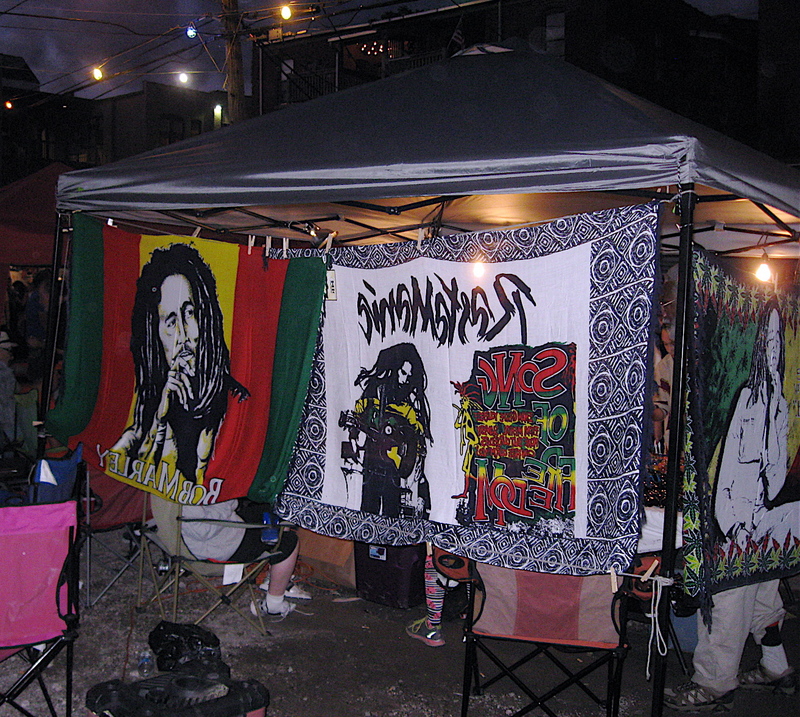 Families, college students, aging hippies, artists, and many others were all there having a good time listening to the music and wandering through the alleys checking out what the vendors had to sell. 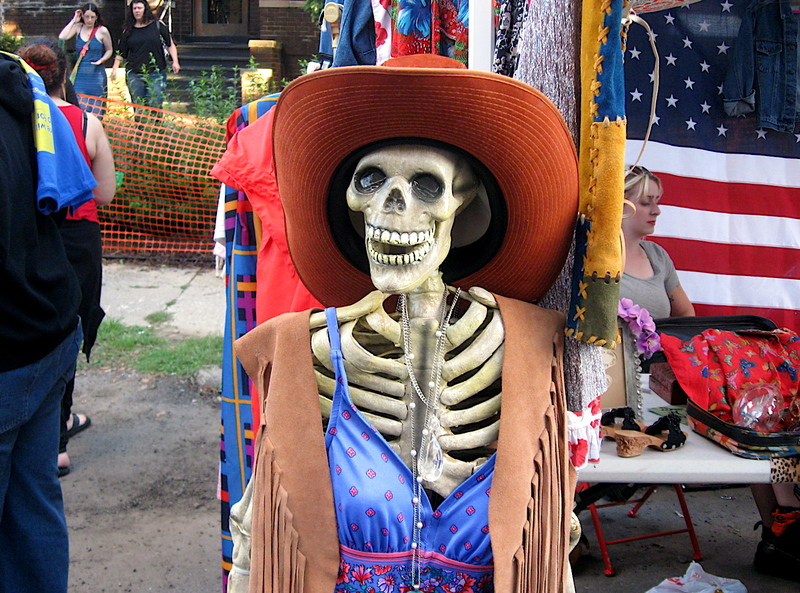 It’s a diverse, interesting crowd that attends the annual party, making for a great day of people watching. The street party runs to midnight and it seemed the later it got, more and more people flowed into the already crowded streets and alleys. Around 10 p.m. there were some fireworks. Not the usual 4th of July type stuff. A utility pole in the center of the alleys started popping. The pole caught on fire and the fire was followed by sparks and loud, bright explosions. 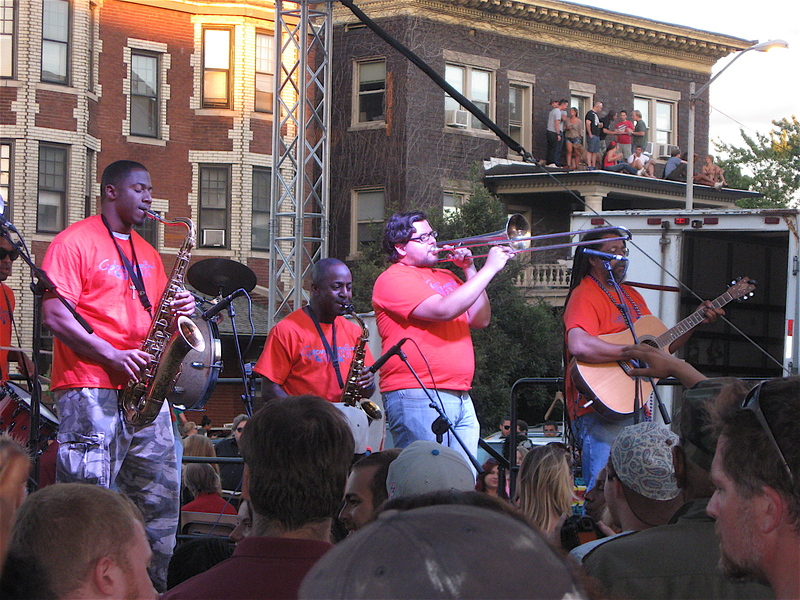 Luckily organizers spotted the fire before the explosions took place and were able to herd people out of the area before the Detroit fire department arrived. It was surreal standing there watching, especially when about sixty percent of the people around me automatically pulled out their iPhones to record what was going on. 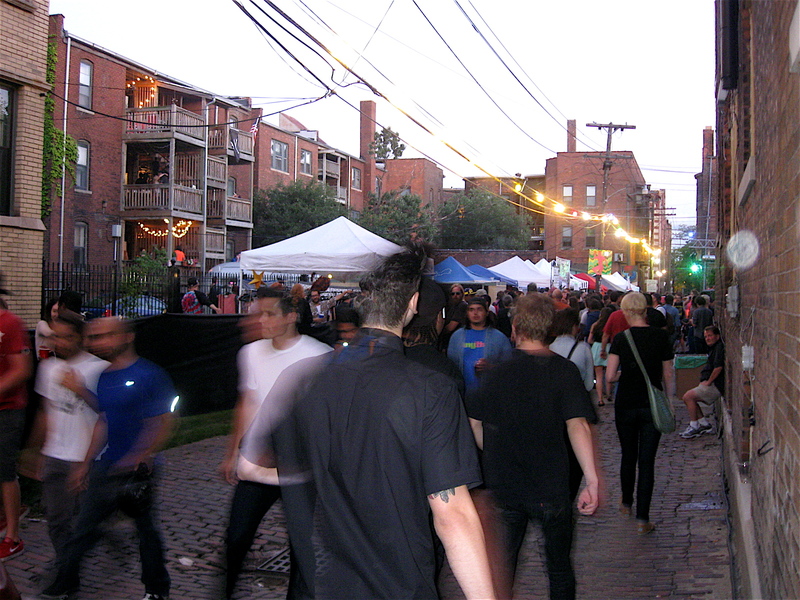 Because of the imminent danger of falling wires, the Dally in the Alley party was cut short much to the chagrin of attendees, vendors and the bands that were scheduled to perform. Based on past Dally’s, I thought the fire was some sort of torch and part of the happenings. It’s always an interesting event, and this year’s was no exception. 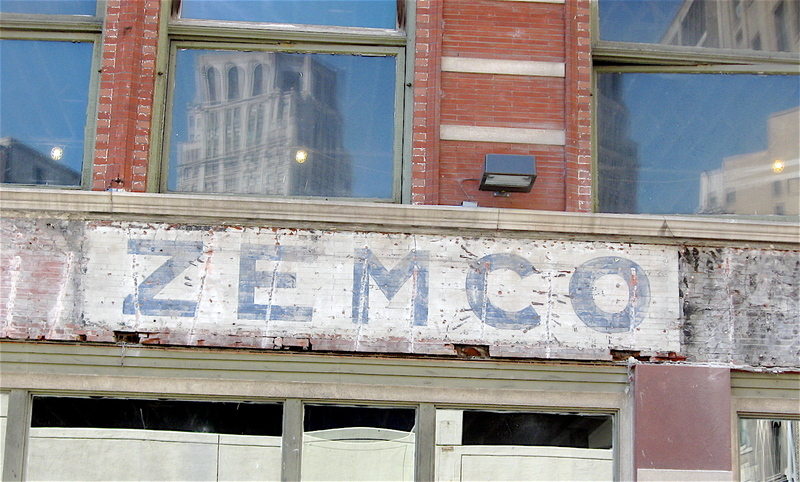 At one time, many of the buildings that lined some of Detroit’s busiest commercial streets had colorful hand painted signs on the sides of them. 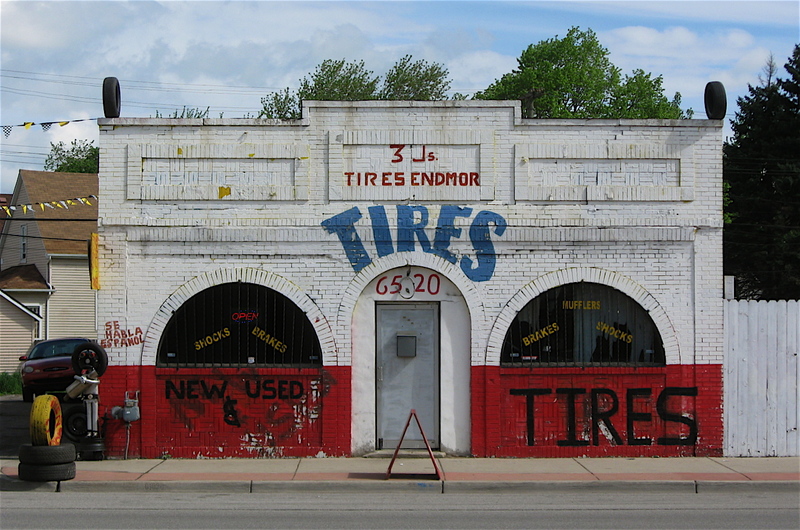 The signs promoted a variety of goods such as flour, clothing, soft drinks, auto parts, and many other items. 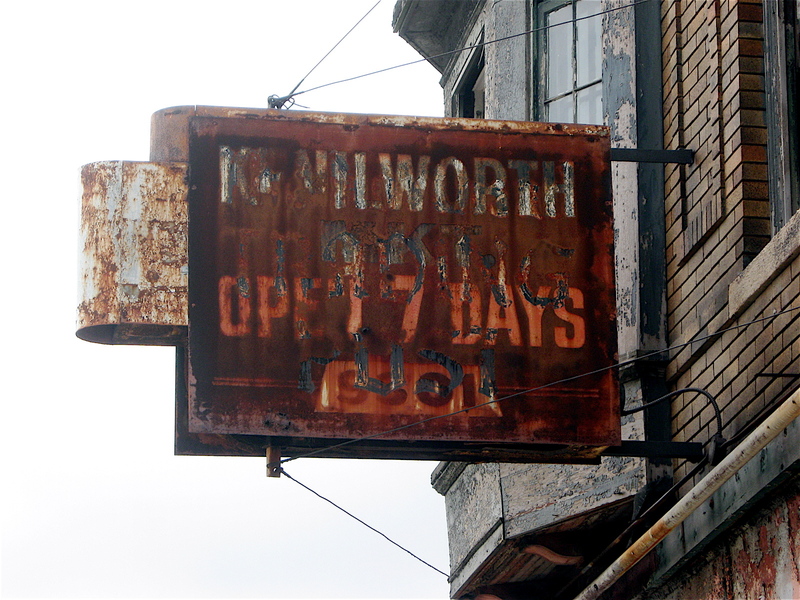 Due to our harsh winter climate and the hot, bright sun of summer, many of the old signs found on the city’s older buildings are slowly fading away. Several of the oldest signs I’ve spotted on my bicycle rides throughout the city go back at least 100 years, maybe further. Because of their age and exposure to the ever-changing outdoor weather, the flowing, stylish letters that were popular on the signs at that time are now almost impossible to read. Other signs out there feature decorative, one-of-a-kind illustrations that emphasize a particular product. 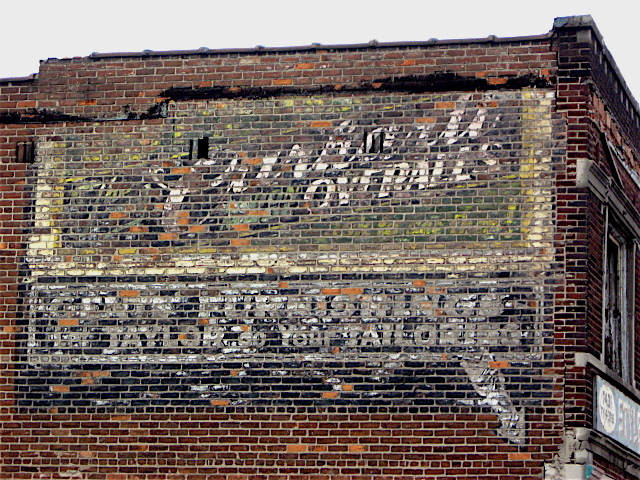 Those, too, are also fading into the brick walls on which they are painted. 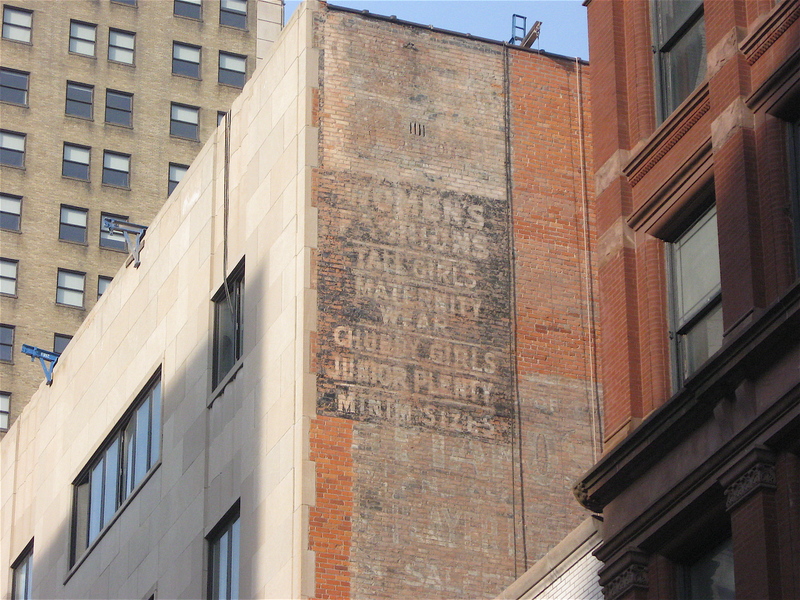 In earlier entries of this occasional series of Detroit’s fading wall signs, I’ve posted numerous photos of the old beauties. Sadly, a few of them have been lost since then because the buildings on which they were painted have been torn down. Also, a few others have been vandalized with spray paint, leaving only partial sections of the original elements visible. 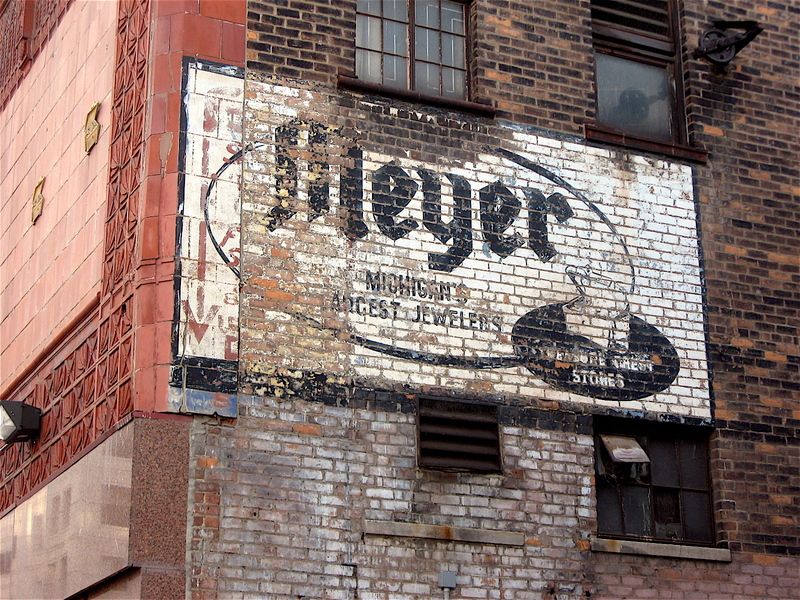 Here is another set of fading sign photos I’ve taken on my bicycle rides in Detroit. 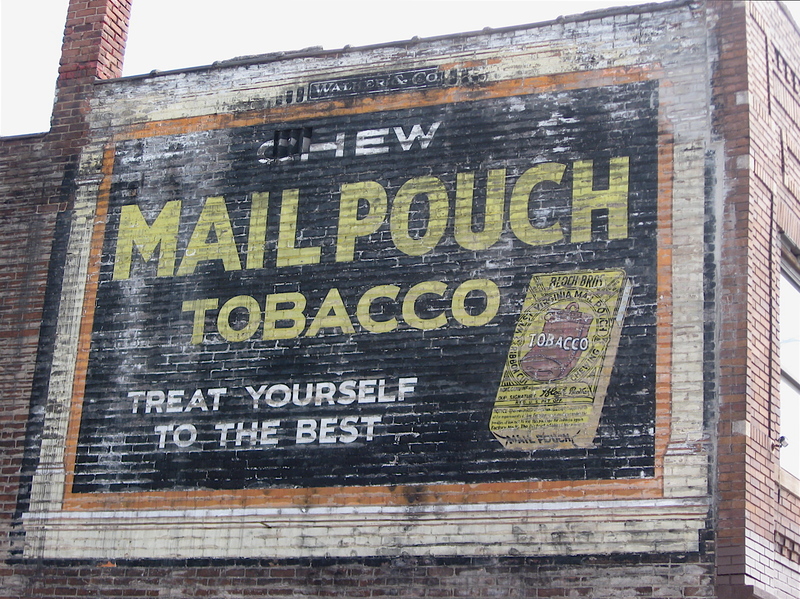 I’m always amazed on how complex some of the aged hand painted signs were back then. I can only imagine what they must have looked like when they were freshly painted. You can check out the previous entries in this series by clicking on the links below.